Hey, friends! It's your resident efficient (lazy) gal Soph, back with another series of hacks to make your beauty life easier. Since my original post was so well received, I thought I'd curate another list of tips and tricks I've picked up in my many years of consumerist product worship - let's get to it! A damp, warm room does not a bacteria-free environment maketh. Keeping your precious cosmetics in the bathroom is like picking up a freshly made quesadilla and throwing it into the dirt: unsanitary blasphemy, and I won't stand for it. Please, please, keep your makeup in a cool space free from direct sunlight - I'm very passionate about the issue. If you're a beauty/skincare enthusiast, you've probably dabbled in the world of micellar water. I, myself, am a huge fan of using the stuff to de-gunk before going in with a cleanser. However, I have also discovered just how wonderful it is for removing makeup stains from carpet, walls (we've all left foundation handprints, let's be honest), and clothing. No more orange collars, hell yeah. I've got to level with you guys - I have been out of brow gel for about four months. Its not that I don't want to buy more, its just that I have more important things to spend my money on (like iced coffee and new lipstick, obvs). But, in this period of poor life decisions, I have discovered that spraying a little - operative word here, unless you want crunchy caterpillars - hairspray to a spoolie, before running it through your brows, will keep them tamed for most of the day. It's no ABH brow gel, but its pretty damn good. 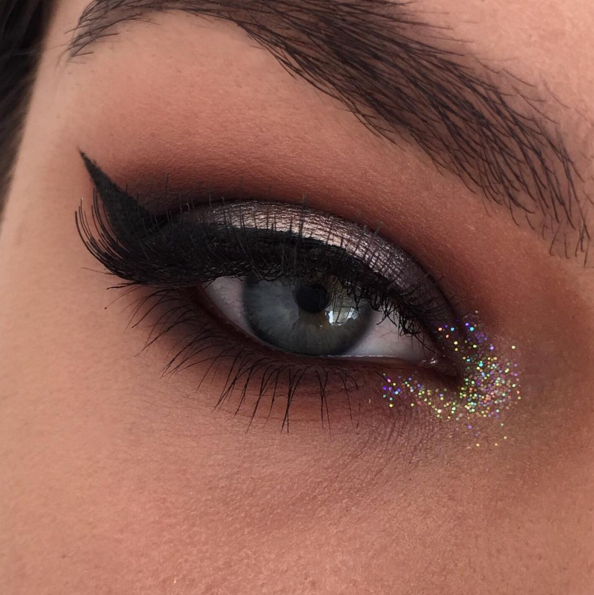 Have a pigment/glitter that you adore but never use because it ends up all over your face, your carpet, and your second cousin's neighbour's niece's carpet? Well refrain no more, friend. Wrap some tape around your finger, sticky side up, and roll it over your skin (whether it is bare or covered in foundation) to pick up any fallout. Shine on, babes. Although high end products are lovely, and I have definitely spent a few squillion of my own dollars on them, I am a huge advocate for finding dupes of cult items and saving yourself a buck or six hundred. Websites like dupethat and Temptalia show affordable options for the most talked about items and god, I love them for it. Halo eyes - that is, when you place darker shadows on your inner and outer corners, then place a lighter colour in the centre of your lid - use shade and light to make your eyeballs appear round and doll-like. Plus they're, like, really pretty. All of those 'Take Her Swimming On The First Date' memes aren't playing around, the UD Setting Spray will actually lock your makeup on. Blogger tested, blogger approved. While it's tempting to pack on about 4 tonnes of concealer when trying to achieve a full coverage look, applying too much product can actually have an adverse effect. Applying a few light strokes under the eyes and spot concealing blemishes allows for a natural - but flawless - finish while avoiding a seriously cake-y look. I wear braids at least three times per week because who was time to wash their hair? Not me, folks, not me. No two wings were created equal, save yourself from gently weeping over your mismatched liner by accepting defeat and popping on some falsies. Do you have any beauty hacks? Share them below!